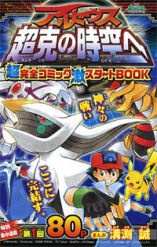 The graphic novel is divided into two chapters; the first chapter corresponds with the first chapter printed in the May 2009 issue of CoroCoro Comics. The second chapter of the graphic novel corresponds with the second (June 2009) and third (July 2009) chapter. This second chatper also includes an extra seventeen pages finishing out the story that was never printed in CoroCoro Comics. 01) "The Climax of the Battle of the Gods"
(神々の戦い、最高潮。) 01) "The Fury of the Legendary Pokemon, Arceus." 02) "The Battle of the Gods Reaches Its Climax. The Creation Pokemon Finally Appears!!" 03) "Witness the Battle of the God Pokemon With Your Own Eyes! Go Through Time and Space to Save the World!!" Satoshi and his friends come across an ancient city named Michiina. At a lake nearby, a battle breaks out between the legendary pokemon Giratina and Dialga. After Satoshi calms the Giratina down and puts an end to the battle, he meets a young girl named Sheena. She explains that Giratina and Dialga, as well as Palkia, are being enraged by a fourth legendary pokemon named Arceus. Arceus had been betrayed by her ancestor, Damos, and is willing to pass judgment on humans if its "Jewel of Life" isn't returned. Sheena presents what she believes to be the Jewel of Life to Arceus, but the pokemon rejects it as a fake and begins attacking! Dialga and Palkia appear to stop the pokemon, but not even their power is enough to stop Arceus! Can Satoshi and the others stop the pokemon's rampage? Giratina joins the battle, but even its power isn't enough to topple Arceus. Suddenly, Dialga sends Satoshi and his friends back in time to stop Damos from betraying Arceus in the first place in an effort to prevent the pokemon's rampage. After witnessing Damos' betrayal firsthand, the young trainers are sent even further back in time. There, they become prisoners of a man named Gishin and get thrown into a cell with Damos. After speaking with Sheena's ancestor for a while, Satoshi and his friends find that Damos isn't acting the same way he was during their first trip through time. Eventually, they determine that Gishin is actually the one pulling the strings and plans to use his Doutakun's psychic attacks to control Damos' mind! As they break out of their prison, Gishin tricks Sheena into presenting Arceus with a fake Jewel of Life, sending the pokemon into a rage. 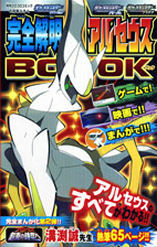 Dozens of Gishin's pokemon focus their attacks on Arceus. 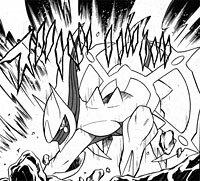 As the attack continues, Gishin dumps a large amount of "silver water" on the pokemon that quickly hardens and glues Arceus to the spot. As the attacks continue, Satoshi and the others arrive on the scene. During a battle between Satoshi and Gishin, Satoshi successfully wrestles the real Jewel of Life from Gishin and, later, destroys the devices Gishin had been using to control his Doutakun and Headran. Meanwhile, Damos and Sheena meet and combine their abilities to stop Gishin's other pokemon from attacking Arceus. The damage to Arceus has been done, and as it lies motionless on the floor, everyone worries that it's going to die. Everyone gathers around the dying pokemon. Satoshi presents the Jewel of Life to Arceus and watches as the orb gets absorbed into its body. Before long, Arceus is revived! Elsewhere, a defeated Gishin pulls a lever that causes the temple to start caving in! It seems like all is lost until a light appears around our heroes. It doesn't take long for them to realize that Dialga is sending Satoshi and his friends back to the present! 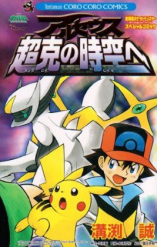 Once they return to their own time, Satoshi and his friends witness Dialga, Palkia, and Giratina returning to their own dimensions. Arceus thanks the young trainers for all their help and directs them to a stone slab showing how their history-changing adventures in the past will be remembered forever.